Posted on 6th December 2018 at 2:53 pm. In line with this, passengers with dementia or autism have been encouraged to apply for a special package of measures in order to help them navigate the airport with more ease. Try Before You Fly sessions – This gives passengers the opportunity to take a look at the airport’s facilities and layout before taking to the sky on their journey. A coloured lanyard – which is a discreet way of alerting trained staff to passengers who have a hidden disability and may require extra support. Over the past 12 months, EMA has drastically improved the way passengers with hidden disabilities are supported. After being rated ‘poor’ in 2017 by the Civil Aviation Authority (CAA), the airport has made major improvements, and their rating was subsequently elevated to ‘good’ in 2018. Support for passengers with both hidden and physical disabilities is provided by the passenger services team, who are able to pre-determine how much or little support is required based on the nature of the disability. EMA works in close contact with airlines to ensure the support service provided is coordinated throughout the journey through the airport and sky. Support with the whole check-in process, from offloading luggage through security and onwards to the departure gates. Over recent months, more than 200 staff have participated in specialist training to help them better understand the needs of passengers with dementia. 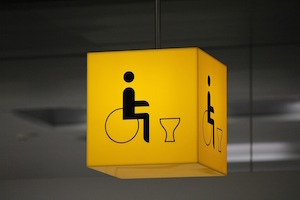 This means employees are better equipped to identify, handle and respond to passengers needs who suffer from hidden disabilities when in an airport environment. Passengers who require assistance at the airport can book through their chosen airline in advance. Further information is also available on East Midland Airport’s website.